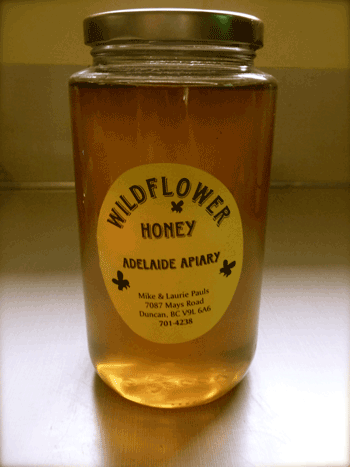 I hopped out of the van at Adelaide Apiary, Mike and Laurie Pauls’s Mays Road farm. We were there for a refill on the honey jar we’d bought a month ago. Laurie greeted me and motioned for us to walk to her shop. “This is the best honey I’ve ever tasted,” I told her. Sounds smarmy but I was being honest. I’m an eat-it-straight-from-the-jar honey lover. This is good stuff. The shop was closed for the winter, but opening soon. There were jam jars on the shelves, scales, tables for fruits and veg. “We sell blueberries in the summer too.” Laurie took my jar and walked over to a big steel container that looked like a coffee dispenser but about 10 times the size. Sweet, sweet honey; a massive warm vat of it. As she flipped up the tap to fill my jar, I imagined pushing her to one side and sticking my mouth under it. Winne-the-Pooh eat your heart out. What she said next slapped me out of my sticky daydream, “All our bees are dead.” Apparently, this winter some mysterious virus swept over Vancouver Island killing nearly every bee in its path. From Parksville to Victoria, few bees have survived. “Our new bees arrive tomorrow,” Laurie reassured me, having noted my horrified expression. She weighed my jar and totaled the bill. I had $20 in hand (anticipating that’s what it would cost for that much honey). “$6.75 please.” Amazing value. She handed me my freshly poured jar of warm honey upon which I cupped my cold hands. Liquid gold, and given the tragedy, just about as precious. Hope you like the honey as much as I do. Ask how her new bees are doing! Great story. We will definitely start getting our honey from here! BTW, the disappearance of honey bees is of real concern to farmers and consumers alike not only on the island but across North America. Some people suspect the bee colony collapse is related to the increased use of pesticides, the proliferation of genetically modified corn, or biotic factors like varroa mites among other factors. Thanks for your comment and for sharing the link. Definitely worth a watch, especially for us food eaters (fewer bees = less food). We are going to go tomorrow and find some… thank-you Maeve!